My mom was a wonderful cook, she would always whip us something fantastic any days of the week. Most of the time, my sister and I would run down to the kitchen smelling what she would be cooking:-) but we always stayed afar because she did not like for us ” de rester dans ses pates” or to be in her way. She was good at everything, mostly.. .
She would make the wonderful desserts, even though she did not like chocolate. I always found that so funny, or so weird that someone did not like chocolate. But she baked us chocolate cakes all the time any way. Mom was more more fond of fruits. She particularly loved strawberries and lemon. 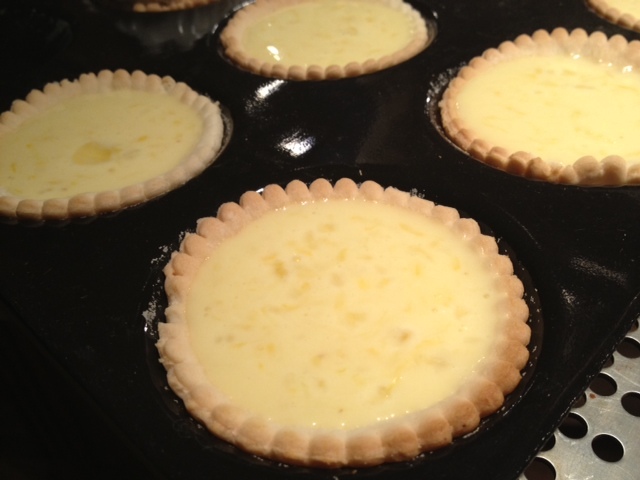 On occasion she would make us une tarte citron, of French lemon pie. She never made them too often as she was the only one eating them. Well, isn’t it funny how our taste buds change with time??? I like tarte au citron much more than tarte au citron meringuee or meringue lemon pie because this French lemon tart is more sweet and tart. It’s like eating a lemon square, just not as heavy and much smoother. 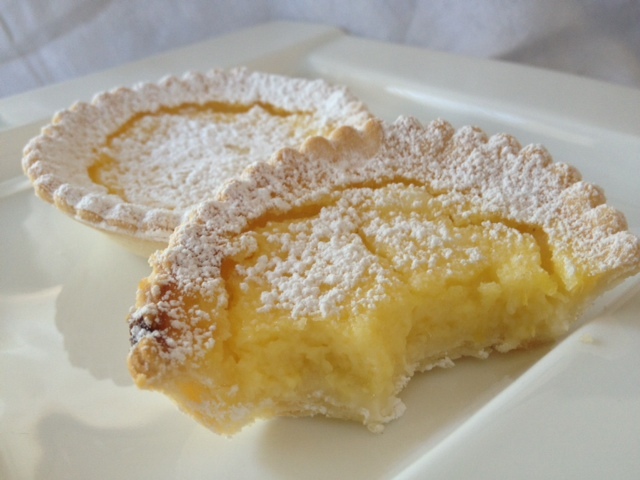 Today I will share with you the recipe of a tarte citron. 1 1/4 cup of flour, 1/2 tsp of salt, 4oz or 115 gr. of unsalted butter. 1 egg yolk beaten, 2 tbsp of water. To make the pie, place the salt and the flour in a bowl. Add the butter cut up in small squares and kneel the butter into the flour until the mixture resembles fine bread crumbs. Add the eggs and stir. Add water up to 2 tbsp to make the dough stick together and you are able to make a pie. Wrap the dough and chill for at least an hour. Take the dough back out and place it on the roulpat. Roll it out. If the dough starts sticking, roll the dough back onto the roulpat and place it back into the fridge for a few minutes. Place the pie into the large tartlet tray, prick the base all around. Place some dry beans and cook at 400 for 12 minutes. Let the pies cool and prepare the filling. Filling: grated rind of 2/3 large lemons. 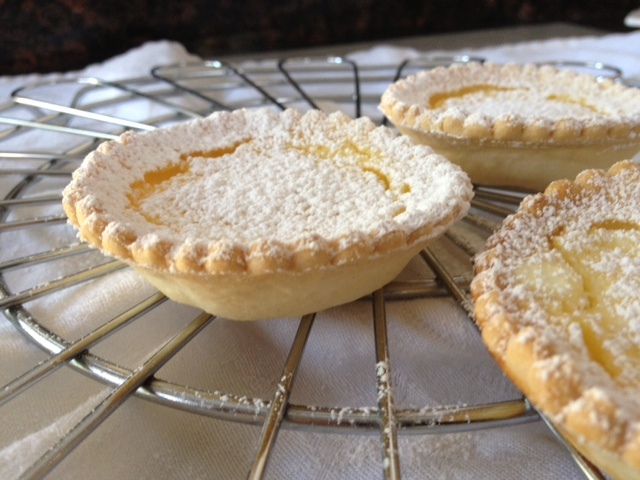 2/3 cup of lemon juice, 1/2 cup of superfine sugar, 1/2 cup of cream, 3 eggs, 3 egg yolks. In a bowl first mix the lemon juice, lemon rind and the sugar and mix. Then add the rest and mix again. Pour the mixture into the pies and cook for 12-15 minutes. Let them cool. Sprinkle some powdered sugar when they are cold, and devour:-) yum!! Today is my youngest child’s birthday. He turned 14. We had chosen not to celebrate his birthday with a big family dinner since we had 2 family birthday parties this week-end already, and he had marching band rehearsal until 6:45. I really felt bad to postpone his birthday until next Sunday so I wanted to make sure that he would at least eat something he would love. So this morning, i inquired him about his wishes for dinner. Guess what he answered;-)….. “I don’t know” That’s what he said. Well, now I had to figure out what to cook. And I chose to prepare caesar’s salad, spaghetti carbonara and chocolate cake for them…So now that their meal was chosen, all I had to do is figure out my meal. And my answer came when I saw those good looking fresh trout filet at Publix this evening. Yum!!! I love trout. It is very mild in taste and if prepared properly does not have a fishy taste. I love its meat. It is very fine and delicate. The fish is so thin that it requires very little cooking time. Great advantage when you are trying to fix two dinners at once ( like me). The best part of this fish is that it requires no frills. It is such a good fish, that just flash saute with a little bit of butter and parsley is enough! But what to fix with it… Haricots verts seemed like a great addition! 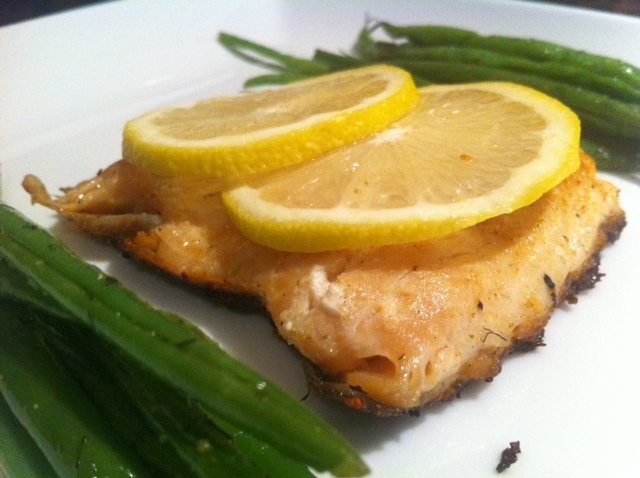 Ingredients ( for 1 person): 1 trout filet, garlic salt to taste, 1 tbsp of butter, half of a lemon. Pat dry the trout filet with a paper towel, and sprinkle garlic salt and pepper on either side. Turn your stove to medium high. In a medium sized saucepan, melt the butter and let it sizzle. When the butter is browning, place the trout skin up in the pan. Saute the trout for 1-2 minutes until it goldens. Flip the trout and saute it for 1-2 minutes again until the skin is becoming brown and crispy. Squeeze half of a lemon all over the trout. Lower the temperature to low- medium, and cover the frying pan with a lid. Keep it covered for 1-2 minutes until the trout is cooked through, and the meat has turned to white ( and is no longer pink). Be careful not to overcook. Lemon and Dill Haricots Verts: 1 bag of haricots verts, 1 tsp of lemon dill demarle herb mix, salt to taste. While the trout is cooking, place the haricots verts in the large fleximold, cover with the octogonal silpat and cook for 3 minutes. When the beans are cooked, add 1 tsp of lemon/ dill Demarle herb mix, 1/2 tsp of olive oil, and salt to taste to the beans and mix well.